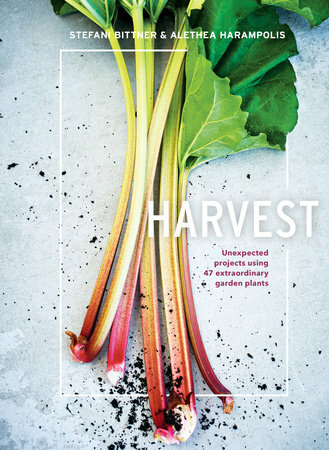 Harvest is beautifully photographed by David Fenton with vibrant-colored subjects that jump right from the page. Now that I have shared one of favorite parts, let me share other portions of this book. Stefani and Alethea share several projects for garden plants and garden enthusiasts that may be used in everyday living situations. For lilacs, they suggest a Lilac Flower Cream to use on “your skin or to flavor sweet dishes.” Also, there is a recipe for Bachelor’s Buttons flower to create a flavored butter to enhance the grilled fish, flank steak, or grilled vegetables. The Scented Geranium recipe presented is a flavoring to rim a glass of pear brandy which can be utilized for your favorite liqueur. Other projects include Lemon Bee Balm Tea, Rosewater Facial Toner, a Persimmon Wreath, Turmeric Dye, and Calendula-Infused Essential Oil. All recipes in this book are creative, useful, and with easy-to-follow instructions for the person who does not prepare their own concoctions on a regular basis. I recommend this book to persons who enjoy creating and preparing from their garden plants other than the ordinary floral arrangement. I received this book from Blogging for Books in exchange for an unbiased opinion and review in accordance with the Federal Trade Commission Guidelines. This entry was posted in Book Review, recommended reading, Reviews and tagged blogging for books, book reviews, books, breakfast, cook, cookbook, cooking, diy projects, food, garden, reading, recipe, recipes, recommended reading. Bookmark the permalink. ← What I’m Reading Now . . . . .